In the first version of Recercare some of the conclusions reported in section 8 (Working tension and “feel”) turned out to be incorrect. I apologize to readers and offer an updated version of the article below. ne serbano le pratiche a guisa di segreto. 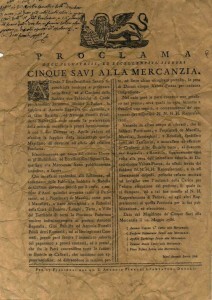 delle arti e mestieri (Venezia 1765). It has been widely held, for example, that eighteenth-century bowed instruments, and especially the violin, had a thin, nasal sound – in marked contrast, therefore, with that of our own century, with its dominance of metal strings: this was generally attributed to the preference of early musicians to string their instruments much more lightly than is done today in ordinary practice (3). The idea became so deeply rooted (mainly because no really serious research was done on the subject) that even important string manufacturers would recommend very thin strings to anyone intending to play baroque music. In recent years, however, a more painstaking study of the historical documents has suggested a substantially different situation, thereby generating afounded doubt that what we hear today in so-called ‘authentic performances’ does not wholly correspond to what was once generally heard (leaving aside matters of performance practice). In fact, just as the reconstruction of early musical repertories and their respective instruments requires accurate comparative studies of the various elements of the past, it stands to reason that the string – the actual generator of sound – should be one of the main points of departure (if not the main one) of that endeavour. Hence, as some studies have shown, the string is no longer just one of the bricks making up the edifice, but rather the “corner stone of the temple” (4). Though strings made out of gut had been used for thousands of years (gut strings for ancient Egyptian plucked string instruments have been found dating from the Third Dynasty), (5) over the centuries a series of improvements were introduced in the techniques needed to produce a good string. On the basis of research we may conjecture that developments in gut string manufacturing consisted not so much in a slow and progressive refinement of construction techniques but rather in periods of abrupt change brought about by the discovery of new technologies. Such innovations spread surprisingly fast and often even had the effect of determining the appearance or disappearance of certain categories of musical instrument. This can be verified if we examine the repercussions of overspun bass strings, consisting of a gut core wrapped with fine metal wire (generally of silver but also of copper or brass). 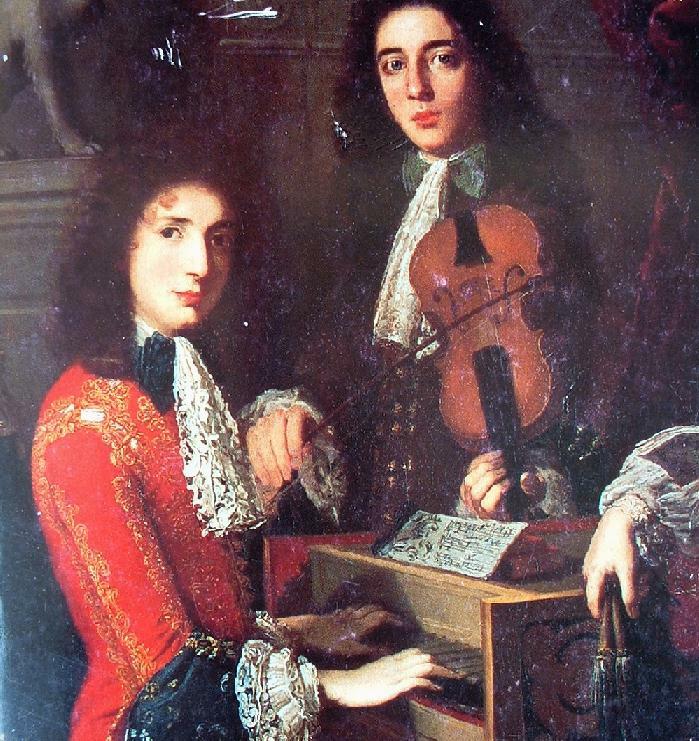 These new strings, a genuinely revolutionary discovery, appeared towards the second half of the seventeenth century, spread rapidly and were directly responsible for the swift abandonment of the awkward bass-violins in use until the end of the seventeenth century (or shortly after) in favour of the emerging violoncello (6). However, it also seems highly likely that, even during periods of relative technological stagnation, string makers probably endeavoured to produce strings to the best of their ability and as perfectly as possible. The rooted idea that the strings of past centuries were a little “primitive” and a long way off the presumed perfection of modern strings needs to be firmly rejected. As a rough guide, we can outline four characteristic “eras” in the evolution of string making. The procedures described are surprisingly similar to those used today but, as string manufacturing was not yet a professional trade, the final product must have been rather variable in quality. The second era. The second period ranged from the second half of the fifteenth to the first half of the sixteenth century. It probably coincides with the appearance of the professional string maker, who perfected manufacturing techniques and raised the quality of strings to the highest possible levels. During the sixteenth century the main centres of string making were also important for the dyeing and spinning of silk and cotton: Barcelona, Munich and Brussels in the early-sisteenth century; Florence, Venice, Nuremberg and Lyon later. It is plausible, perhaps, that the string makers learned from the more complex techniques used in the spinning of silk: processes that would have allowed a significant initial reduction of the stiffness of the thicker strings used in the bass register. In fact, we may deduce that bass strings were, probably, even more efficient than before, if instrument makers were able to permit themselves important structural developments: in the case of the lute, a sixth course was added some time towards the end of the fifteenth century, thus extending the instrument’s range by as much as a fourth (sometimes a fifth) below the fifth course; the same happened to the bowed viol. The third era. The next era began in the second half of the sixteenth century with a further leap. In this period a seventh course, generally tuned a fourth (sometimes a fifth) below the sixth course, was added to the lute (other additions were soon to follow), while on bowed instruments, string lengths seem to have been reduced (8). Recent studies (9) have tended to show that these changes resulted from the application of a revolutionary idea: the increase in the specific weight of the gut in bass strings by means of special treatments involving heavy mineral salts. 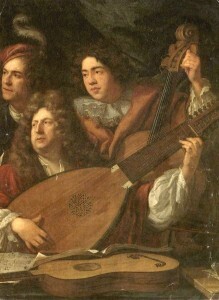 Amongst other things, this is suggested by the seventeenth-century iconography, which shows bass strings of a dark red, brown or blackish colour very different from the typical yellowish colour of natural gut higher strings: in all likelihood, this was a direct consequence of the loading process. This new technique allowed makers to produce thinner yet more sonorous bass strings. Anonymous french portrait of a lutenist, second half of the seventeenth century, Kunsthalle, Hamburg. But the most stringent confirmations come from the bass stringholes diameters in the original bridges of surviving lutes. Those holes are too small for a plain gut string to possess the necessary working tension for the right pitch, unless its weight was appropriately increased. Such trick would have granted the production of much thinner and sonorous bass strings than those previously in use, which would fit in those holes with the right amount of tension. Against this theory speaks the fact that modern loaded strings, as produced to date, are not transparent; a quality which is allegedly described in the ancient sources. To this point, however, it must be pointed out how historic documents (with the only exception, perhaps, of the Mary Burwell lute tutor) refer, in fact, to the lute’s upper and mid registers, not to the basses. This phase, corresponding to the age of Monteverdi and Stradella, marks probably a peak in the complexity of gut string making, establishing a level of quality that was to remain unsurpassed. The fourth era. The last era – which still continues today – is marked by the advent of overspun bass strings consisting of a gut core (i.e. an ordinary plain gut string) over which is wound a fine metallic wire; the windings can be either close or open. The oldest extant document attesting this technique dates from 1659: “Goretsky hath an invention of lute strings covered with silver wyer, or strings which make a most admirable musick. Mr Boyle. […] String of guts done about with silver wyer makes a very sweet musick, being of Goretskys invention” (10). This is closely followed by John Playfbrd’s viol treatise of 1664 and other works (11). However, the spread of these more efficient basses was not as rapid as one might imagine: the viol player Sainte-Colombe introduced them to France only around 1675 (12), and in Italy, a country renowned for its string production, the earliest evidence is from the year 1677 (13). The earliest extant iconographic evidence of a violin with a white fourth string (probably over-spun with silver) can be dated to the mid. 1680s (14). It goes without saying that this discovery probably had a dramatic impact on both music and instrument making; it could even be described as a watershed, dividing before and after. For while treble instruments like the violin had always been eminently manageable, the larger instruments were disproportionately unwieldy if we consider the range that was comfortably reached by the fingers of the left hand. It is easy to understand, therefore, that as soon as efficient bass strings became available, the instrument makers shortened the vibrating lengths of several of the da fondamento instruments so as to make them more manageable. This also meant that the violin could use the fourth string more efficently and therefore more frequently than before. Before examining the typical characteristics of eighteenth- and nineteenth-century violin stringing, a topic that squarely falls within the fourth era, it is worth briefly assessing the period preceding the introduction of wound bass strings so as to present the typologies of string available in the late seventeenth century and actually used on this instrument. comprehensive document on stringing in the period before Bach is the treatise by Thomas Mace. Its most notable aspect — one that had already been mentioned many years earlier by John Dowland (15) — is its division of the strings (in this case for the lute, the most problematic instrument for stringing at that time) into three basic “sorts”: strings for the Trebles (Minikins, Romans), strings for the Meanes (Venice-catlins), and strings for Great-basses (Lyons or the “deep dark red” coloured Pistoys) (16). What this arrangement strongly suggests is not so much a simple commercial distinction or a grouping according to provenance (ever since the early sixteenth century, strings had been named after their respective areas of provenance) as differing types of technology. It seems to imply that diversified manufacturing strategies were followed in order to produce strings that were suited to each register and to ensure a perfect “acoustical” transition between registers. 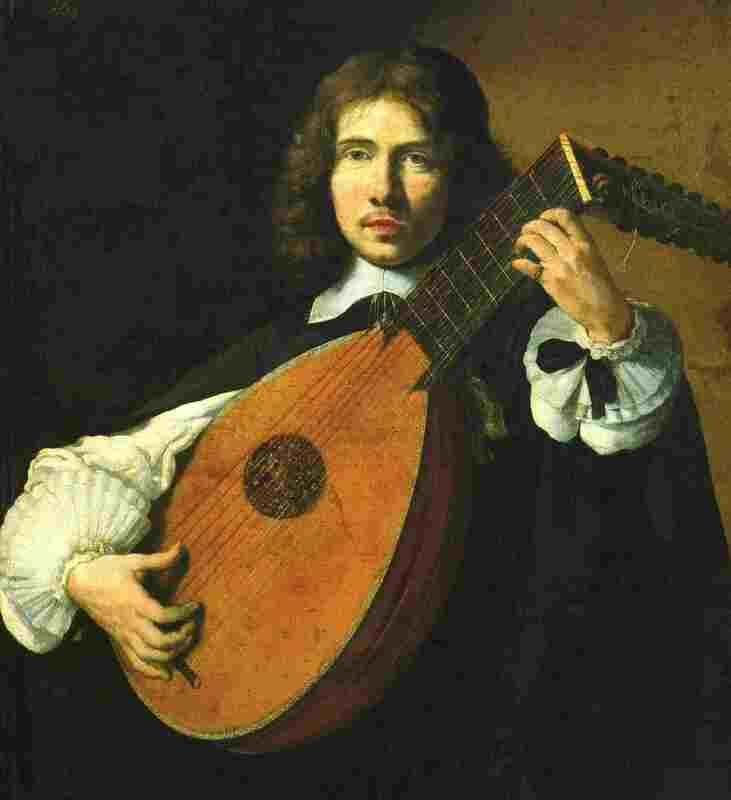 To our experience (as stringmakers) of a working all-gut strung lute the characteristics of each type would appear to be: maximum resistance to wear and breakage for treble strings, maximum elasticity for the strings of the middle register, and an increase in specific weight and elasticity for the bass strings. Finally, though the earliest mention of overspun strings is from England and precedes his treatise, Mace’s description of Bass strings still refers to the all-gut strings made exclusively in Italy and France. An example of seventeenth-century violin stringing is given by James Talbot: “Best strings are Roman 1st & 2nd of Venice catlins: 3rd & 4th best be finest & smoothest Lyons, all 4 differ in size” (17). This is corroborated by iconographic evidence showing an obvious difference between the first two strings, which are light yellow, and the third and fourth strings, which are distinctly brown (18). To our knowledge, the only seventeenth-century author to give an idea of the gauges of violin strings is Mersenne. His indications, though general, are useful: “la chantarelle des dessus est aussi grosse que la quatriesme des luths” (the violin first string is the same size as the fourth string of the lutes) (19). This means a diameter of between 0.70 and 0.80 mm for the violin first string (20). With the introduction of overspun strings (and with the consequent increase in demand for them, especially from bowed instruments), the techniques of making all-gut bass strings declined rapidly and were forgotten by the new generation of string makers: just by wrapping a thin metal wire around a gut string one got a much larger sound. As a result, the manufacture of these new strings probably passed immediately into the hands of the luthiers, and sometimes into those of the musicians themselves: the winding of a normal gut string with metal wires would have hardly constituted a problem for the more enterprising among them (21). The early eighteenth century must have witnessed a drastic narrowing of production: by mid-century the treatises and documents are no longef referring to the wide range of gut commodities described in the previous century (22). In its place there arose a uniform system of string manufacturing that remained in use in the following centuries — and to a great extent still applies today. String manufacturing technique. Though at first glance the procedures for making gut strings in the eighteenth century look remarkably like those in use today, there were substantial differences. And what these differences unquestionably suggest is that the earlier strings (right up to the end of the nineteenth century) were more elastic, and hence better, than those available today. String making (figure 1) in the past required the use of a whole lamb-gut of a length of at least 50 feet (23). After careful cleaning and rinsing in running water for several days, the gut was subjected to a series of treatments to eliminate the non-muscular membranes and fatty substances. This was done by immersing the gut in alkaline solutions of increasing concentration for a few days, after which the undesirable substances were easily removed with the back of a knife or a fragment of cane. The alkaline solution consisted of plant ashes (potash) mixed with water. The diluted concentrations were sufficient to remove the more easily soluble fatty substances, while the highest concentration was left to the end of the treatment, when more aggressive action was needed to remove all the residual unwanted substances. During this stage a small amount of rock-alum could be added; it would have had a shrinking and tanning effect, thus slightly hardening the gut. In short, the alkaline baths ensured that the organic material underwent a combined process of fermentation and soaping to facilitate the detachment of the undesirable parts, while leaving the muscular membrane — the part that interested the string maker—free of extraneous matter and perfectly degreased. After this treatment guts were carefully selected and grouped together in parallel strips (according to the diameter of the string to be made) and knotted at both ends. The strips were then attached to a special wheel used for twisting the string while the other end was fixed to a peg at the side of a drying frame (figure 1). After sufficient twisting, the free end of the damp string was disconnected from the wheel and tied to a peg at the opposite side of the drying frame and placed under tension. When the frame was full, it was taken to a special room where the strings were subjected to a process of whitening by sulphurization. This involved burning sulphur in a basin and subjecting the strings, for several days, to the whitening action of the sulphur dioxide fumes. When this was completed, the strings were further twisted and given a final drying in the open air for just a few hours. The very last stage consisted of polishing the surface of the strings using a grass with abrasive qualities (equisetum or horsetail) soaked in alkaline solution or tempra. The perfectly polished strings were then rubbed with olive oil, cut from the ends of the frame, wound in circular bundles and put into boxes. Each box could contain from fifteen up to thirty or more strings soaked in olive oil (24). There are therefore substantial differences between the procedures followed then and now. The first important difference is that today lamb’s gut has often been virtually abandoned and replaced by material from more mature animals. Secondly, most stringmakers in the eighteenth century, and much of the nineteenth, used whole gut, whereas in modern practice a special machine is used to cut the material into ribbons; this helps to reduce string conicity, a problem that had always affected the production of chanterelles. It is generally thought that cutting into ribbons was first practised by the late eighteenth-century German makers, though in fact it already existed in Italy around the mid sixteenth century: see the second Roman stringmaker’s statute (the document, which I have examined, is dated 1587 and was discovered in 1999 by Marco Pesci of Rome). In other worlds there are statute rules that inflicted heavy fines on string makers — Roman makers in this case — who were caught splitting gut into halves (“spaccare le mazze, o budelle per mezzo“) (25). Evidently, despite the advantage of obtaining more regular gauges, the most powerful corporation of string makers (that of Rome) did not consider it a good practice. Another difference is that today the fatty substances are removed by using pure sodium carbonate instead of potash, which is an impure potassium carbonate obtained by burning vinasse and wine dregs. And for the whitening process, string makers today use oxidizing agents such as hydrogen peroxide or sodium peroxide. The last substantial difference from past practice is that the dried rough strings are no longer lightly smoothed with abrasive grass (or pumice powder), but rectified by a special machine (uncenterless machine) capable of producing the wide variety of diameters in demand today. While at first glance it might seem that modernization merely introduced a few welcome improvements after centuries of unchanged string making technology, this is not entirely correct. Certain seemingly insignificant steps in the earlier process have been unduly overlooked. This is quite evident if we compare modern strings with the few surviving samples of old strings (even relatively recent strings dating from the beginning of this century). The former are often stiff, hard and only lightly twisted; the latter are pliable, soft and highly twisted. In addition, modern strings have, normally, a very short string life unless they are varnished. The difference in string life is easily explained. Strings made of whole guts and lightly polished by means of abrasive grass or pumice have much fewer broken fibers on their surface than those made from split guts and brought to the desired diameter by mechanical rectification that forcibly removes significant quantities of material from the string’s surface. The second important aspect to have a serious effect on the string’s acoustical performance is the sacrifice of elasticity in favour of strength of tension. This almost suggests that today’s strings are built to stand up to a tug-of-war and not to provide as good a sound as possible. Instead, to play well, a string must have the capacity to transform the mechanical impulse transmitted by the bow or the fingers into a vibrational movement that is, as far as possible, devoid of the internal frictions that would reduce the efficiency of that transformation. On pense qu’y a encore une légere opération a faire aux cordes avant de les exposer en vente; elle consiste vraisem-blablement à les frotter d’huile pour les adoucir et les rendre encore plus souples: mais les boyaudiers en font un mystère; ils assurent qu’ils ne se servent point d’huile, et que c’est dans cette derniere manoeuvre que consiste tout le secret de leur art. Le boyaudiers ont raison d’assurer qu’ils ne se servent point d’huile pour assouplir et donner du son a leurs corde, mais ils y emploient des sels qui sont extraits de la lie de vin (27). (It is thought that there is still a light operation to be done on the strings before exposing them to the wind: it seems to consist in rubbing them with oil to soften them and make them even more pliable. But the gut-makers make a mystery of it. They assure you that they make no use of oil and that it is in this last operation that the whole secret of their art lies. The gut-makers are right to assure us that they do not use oil to soften and give sound to their strings, but for that they use salts extracted from wine dregs). As general rule, modern strings are often less twisted than the strings of the past. This is shown not only by the historical documents, but also by the examination of several surviving samples of old gut strings (28). It goes without saying that the degree of twist is fundamental in determining the elasticity of a gut string (29). Old strings were made, in most of cases, with a high twist, with the exception of lute-chanterelles, the strings subjected to the severest working conditions. We also note that the softening effect of “oil of tartar” on gut permits a much higher degree of twist than the highest level obtainable using modern techniques. More research needs to be done before we have a better understanding of why the old string makers took several days (up to eight) (30) o conclude the whitening process.In fact, it is only recently that researchers have started to grasp — as the ancient string makers had long been empirically aware — that there was something more to this laborious and awkward process than a matter of whitening the string, an operation that might even seem superfluous (Galeazzi actually disapproved of excessively white strings) (31). What was really involved was the formation of sulfide links between the long chains of collagen, the main constituent of gut, in order to increase elasticity at the expense of plasticity. In short it amounted to a genuine process of “vulcanization“, rather like the transformation of an iron wire into a musical steel string. ing maker Philippe Savaresse: “Le soufrage influe aussi beaucoup sur la qualité des cordes. II est indispensable pour les obtenir bonnes” (Sulphuring has a very strong influence on the quality of the strings. It is indispensible for making them good) (34). Believing — erroneously, as we have just seen — that sulphurization was merely a process for whitening the gut, twentieth-century string makers decided to carry out the same operation using more convenient chemical solutions. Often, however, especially if used either inexpertly or to excess, these chemical agents can weaken the material and lower the strings resistance to breakage under tension. Finally, even the function of olive oil seems to be more important than previously thought. Hitherto it has been seen as fulfilling a simple aesthetic function after the polishing process. This would be reasonable enough if it was just a matter of giving the strings a light oiling before packaging. But in the Italian tradition the strings were literally soaked in oil in impermeable packages for a considerable length of time — probably months, if we consider that strings that were too fresh were generally never used on instruments. The careful observer will note that gut strings given a long soaking in olive oil acquire a special consistency as if they had undergone a tanning treatment (very like the fat- or oil-tanning carried out since time immemorial on skins and leather to make them last longer). In fact, treating a gut string in this way increases its life. This also seems to be the function of the rock-alum added to the alkaline solution before the twisting phase (35). The logical conclusion would appear to be that the strings made in the past were probably, in most cases, superior from the points of view of acoustical performance and durability. Those made today, on the other hand, can boast precise dimensions and therefore rarely sound untrue, which was the constant problem of strings made before the introduction of mechanical rectification. During the eighteenth century the main centre of string production was Rome, which in 1735 boasted as many as twenty workshops (controlled by very strict statutes (img)) (36). Roman chanterelles remained famous throughout the eighteenth century until the eventual disbanding of the powerful Roman corporation. Thereafter primacy in quality production was taken over by the accomplished string makers of Naples (img), closely followed by those of Padua (img). In 1786, the two most important Paduan workshops were those of Antonio Bagatella and the firm of “Gio. Battista, ed Antonio fratelli Priuli detto Romanin”, founded in 1613 by Antonio Romanin, a string maker possibly of Roman origin, and closed down in 1911 (37). De Lalande wrote that: “La fabrication des cordes de violon est une chose qui est presque réservée a 1’Italie; Naples & Rome en fournissent toute 1’Europe, & il y a touiours beaucoup de mystère dans ces branches exclusives de commerce” (The making of violin strings is a phenomenon that is almost completely restricted to Italy, with Naples and Rome supplying the whole of Europe and there is always a great mystery surrounding these exclusive branches of trade) (38). Galeazzi gives the following indication: “Veniamo finalmente alle corde: devonsi provvedere le corde alle migliori fabbriche d’ltalia; quali sono quelle di Padova, di Napoli, di Roma, di Budrio sul Bolognese, e delI’Aquila nell’Abbruzzo. Vi sono ancora altre fabbriche in Citta di Castello, Perugia, Rieti, Teramo, ed altri luoghi; ma le prime portano il vanto, specialmente quelle di Padova, e di Napoli” (Let us finally consider the strings: they should be acquired from the best manufacturers of Italy, such as those of Padua, Naples, Rome, Budrio near Bologna and L’Aquila in the Abruzzi; there are other manufacturers at Città di Castello, Perugia, Rieti, Teramo and other places, though the first to be mentioned, particularly those of Padua and Naples, are the most prestigious) (39). Interesting information on string making in the Bologna area is supplied by Natale Cionini (see Appendix). Spohr reports: “Es giebt Italiänische und Deutsche Saiten. Letztere sind aber viel schlechter wie jene und zum Solospiel gar nicht zu gebrauchen. Auch die Italiänischen Saiten sind von ungleicher Güte und in der Regel die Neapolitanischen den Römischen und diese denen von Padua und Mailand vorzuziehen” (There are Italian and German strings. The latter are much worse and cannot be used for solo playing. Even the Italian are of unequal quality and as a rule the Neapolitan are to be preferred to the Roman, which in turn are to be preferred to those of Padua and Milan) (40). The incomparable quality of the Neapolitan violin chanterelles — but also those for other instruments (41) — remained a mystery to the French string makers, who succeeded in making all types of strings except the violin chanterelles, which were imported to France in large quantities and at prohibitive prices. Towards the end of the eighteenth century, the French offered a prize to the maker or makers capable of producing a chanterelle equalling in quality the Neapolitan strings. The gold medal went to Philippe Savaresse, the Parisian string maker of Neapolitan origin (! ), who brilliantly solved the problem: as had already been noted several decades earlier in De Lalande’s Voyage, the “secret” was that in Naples and in other parts of Italy, but not in France, the guts of rather young animals were used (42). (The famous firms were those of Berti and Colla in Rome, of Rufini in Naples. Highly prized today are the products of Righetti in Treviso, Raffaele di Bartolomeq in Naples, Nicola Morante at Tavernale di Barra (Naples) of Nicola Di Russo and Raffaele Pistola Profeta (Ruffini’s heir) at Salle (Pescara), of Luigi D’Orazi again at Salle and Conti at Mugellano (Rieti) […]. After Italy and Germany comes France, which produces excellent strings above all for the harp; the strings of Lyon have an excellent reputation). What were the criteria for distinguishing a good string from a bad one? Before answering this question we must stress that the professional musicians seem to have developed an acute skill in detecting high quality material by touch and by sight, and in distinguishing a false string from one that vibrates well. These skills were transmitted orally from master to pupil, according to a tradition that probably began to decline at around the beginning of the twentieth century, when musicians tended to trust blindly in the products of the large string manufacturers. (45)Thereafter the main choices, in terms of manufacturing strategies and standard gauges, tended be imposed by the large firms that emerged at the turn of the century in France and Germany (but not in Italy). As for the Italian string makers, before and after the First World War most of them either closed shop or emigrated (chiefly to America), thus bringing to a rapid end a glorious tradition that had lasted for centuries. “La buona corda dev’esser diafana; color d’oro; cioè che dia sul gialletto, e non candida come alcuni vogliono; liscia; e levigata, ma ciò indipendentemente dal-1’esser pomiciata; senza nodi, o giunte; al sommo elastica, e forte; e non floscia, e cedevole ” (A good string must be transparent and golden; that is, it must tend towards light yellow and not white as some people want; smooth and polished, even regardless of whether it has been pumiced; without nodes or joints; supremely elastic and strong; and not limp and yielding) (46). “La corde la meilleure et qui doit faire le plus long usage, est celle qui change le moins d’aspect quand on la monte sur rinstrument: celles qui se ternissent et perdent leur transparence ne doivent pas resister” (The best string and that which should last longest is the one which changes its appearance least when it is mounted; those that tarnish and lose their transparency will probably not last) (47). “Die äussern Kennzeichen einer guten Saite sind: weisse Farbe, Durchsichtigkeit und glatte Oberfläche. Doch darf letztere nicht, wie bey den deutschen Saiten, durch das Abschleifen mit Bims-Stein hervorgebracht seyn, da geschliffene Saiten stets schreiend und falsch im Ton sind” (The distinctive external characteristics of a good string are: white colour, transparency and smooth surface. However, this last quality must not be obtained, as happens with German strings, through polishing with pumice stone, for the polished strings are always strident and false in tone) (48). “Les chantarelles, dit M. Ph. Savaresse, doivent êntre transparentes, parfaitement unies et assez régulierès de grosseur. Elles ne doivent pas être trop blanches, car cela prouverait qu’elles ont été faites avec des agneaux trop jeunes, et lorsqu’ on serre un paquet de chantarelles sous la main, elles doivent paraitre élastiques et revenir promptement comme le ferait un ressort d’acier. […] Les grosses cordes, deuxième et troisième, doivent, au contraire, être’transparentes et très blanches. II faut, en outre, qu’elles soient très molles quand on en comprime un paquet, mais elles ne doivent pas changer de couleur et elles doivent revenir promptement à leur ètat cylindrique; si elles présentaient trop de raideur, cela indiquerait qu’elles ont été faites avec des boyaux trop réistants, et, dans ce cas, elles auraient une mauvaise qualité de son” (The chanterelles, says Monsieur Ph.Savaresse, must be transparent, perfectly united and very regular in thickness. They must not be too white, for that would show they have been made with lambs that were too young; and when you squeeze a packet of chanterelles they must feel elastic and return promptly as a steel spring would do. […] The bigger strings, the second and third, on the other hand, must be transparent and very white. Moreover, they should be very soft when the packet is pressed, but they must not change colour and must return promptly to their cylindrical state. If they are too stiff, that means they have been made of over-resistant gut, in which case they will have a poor tone) (49). “In selecting the E string, choose those that are most transparent; the seconds and thirds, as they are made with several threads, are seldom very dear. The firsts never have more than a few threads in them, and hence, absence of transparency in their case denotes inferior material” (50). a pomice non giova alla buona sonorità: deve essere molto elastica e perfettamente cilindrica […]. Per provare 1’elasticità basterà comprimere con le dita una corda ancora attorcigliata e fare 1’esperimento, per esempio, fra una tedesca ed una italiana (51). The good string must not be too smooth and white, for the use of pumice is not good for the sound. It must be elastic and perfectly cylindrical […]. To test the elasticity it is sufficient to press with one’s fingers a string in its bundle and then compare, for example, a German and Italian string). The strings for the violin and the other bowed instruments from the beginning of the eighteenth century onwards can be grouped into two categories: the oiled all-gut strings with a medium-high twist for the medium-to-high registers; the overspun strings for the basses. If we compare the situation with that of the seventeenth century, we note that the plain gut strings specifically made for middle registers (Venice catlins) all but disappeared, making it more difficult to obtain a balance in timbre and dynamics between the higher all-gut higher strings and the overspun basses. This was particularly acute in the case of the bass-viol: to resolve the problem, the viol fourth ‘c‘ was a loosely overspun string (a so-called demi-filée) that ensured a smoother balance of tone between the all-gut third and the fully overspun fifth (52). Already from the late seventeenth century (see Gabbiani painting of 1685), violin stringing in Italy (and also in the German-speaking countries, starting from mid eighteenth century) would seem to have consisted of plain gut for the first three strings and an overspun string for the fourth only (53). As regards France, only one source clearly specifies that the third also (as well as the fourth) should be overspun, though the metal wire was to be wrapped in such a manner that there was no contact between the winds; in other words, it was demi-filée (54). This, however, must not lead us to exclude categorically the potential use, in eighteenth-century France, even of an all-gut third string. 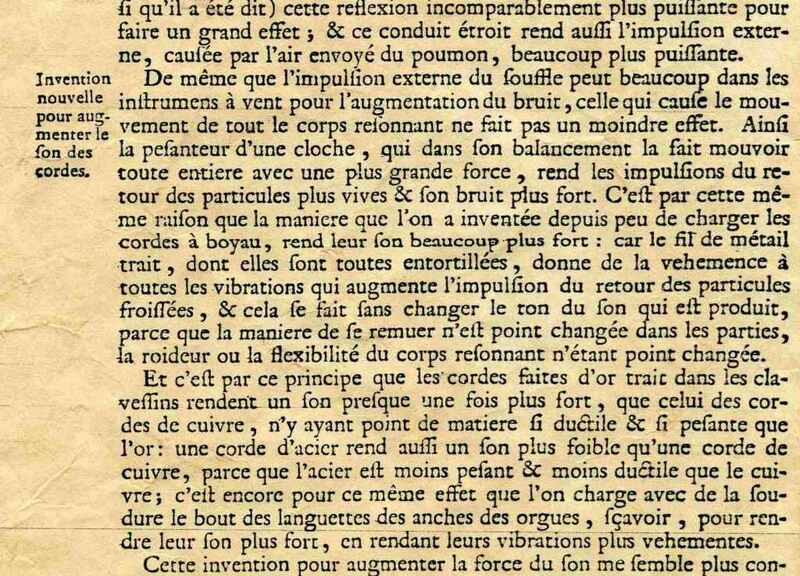 Brossard clearly specified to the reader the effect that metal overspinning has on the thickness of the string: “… Si elle est simplement de boyeau, elle doit estre du moins le double plus grosse que la 3e, mais si elle est toute filée d’argent elle n’est que tres peu plus grosse que la 3e …”. The Italian stringing method (plain gut for the first three strings plus a 4th wound string) would appear to have remained unchanged throughout the nineteenth century and the early years of the twentieth, and it was probably only in the 1920s that the third string of natural gut gradually began to be replaced by strings overspun with aluminum, which were generally used together with higher strings made out of the steel for piano strings (55). An important element in determining the working tensions of violins of that time was relates to the frequency of the pitch standards that were in use in the eighteenth-nineteenth century, which varied considerably, and not only from place to place, but also in the same place from one period to another. In 1834 the Congress of Stuttgart approved a tuning standard of A -440 Hz, but this recommendation was not followed. In 1858 the French government reported that the tuning standard of the Paris Opéra and the Opéra Italienne was A -448 Hz, but a year later a French commission for the standardization of tuning (composed of illustrious figures such as Halévy, Auber, Berlioz, Meyerbeer, Rossini and Thomas) – the first in Europe – established A- 435 Hz through an imperial decree. In England, orchestral pitch was A -424 Hz in 1813, but this was raised to 452 Hz in 1859. The supposed nineteenth-century tuning standard of A- 435 Hz seems to have been an illusion rather than reality, and this is certainly true up to the second half of the nineteenth century. With the Congress of Vienna of 1885 the standard A was officially established at 870 simple vibrations, or 435 double Hz, a recommendation that was also adopted by the Italian government in 1887, but in fact the tuning standard continued to fluctuate. Only with the meeting called in 1939 by the International Organisation for Standardisation was the situation presented by the jungle of different tuning standards clarified, proposing a standard A of 440 Hz. The rest is recent history. We will consider, for the sake convenience, A -435 Hz. 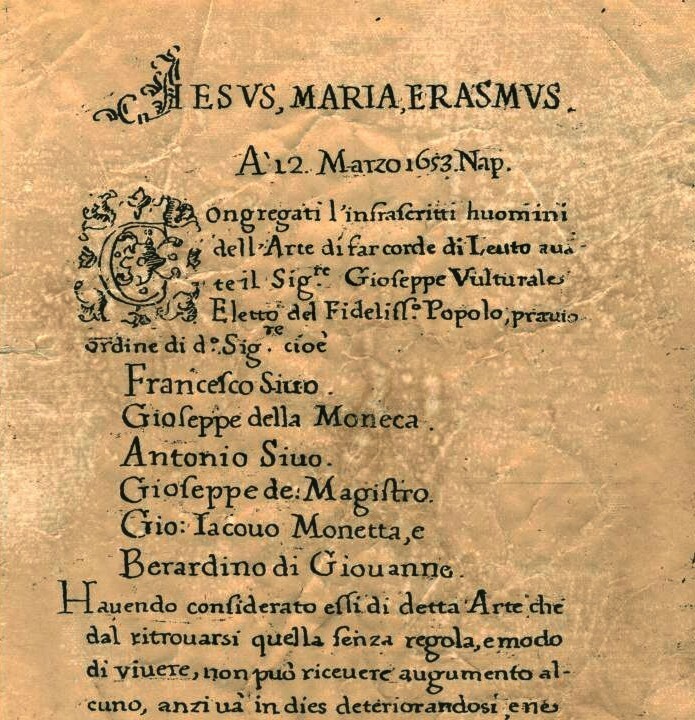 To discover the gauges of early strings and to establish their working tensions, the contemporary documents and treatises must of course be considered (as researchers have done in the past), but I would propose doing it from a slightly unorthodox viewpoint: our main point of departure must be the information (both direct and indirect) that can be derived from the string makers themselves. This would seem the right approach because, whatever the treatises and violin manuals said, in the end it was the string makers who established (or rather imposed) the commercial diameters. The diameters are in turn unseparably linked to the number of guts used to make a string. Obviously a specific number of guts corresponds not to a specific gauge but to a mean value, with a degree of oscillation on either side: guts, being natural products, are never exactly the same size. This is a fundamental consideration that needs immediate clarification. Unlike today, when mechanical processes of rectification allow makers to produce a wide variety of progressively scaled string sizes (e.g. : 0.60, 0.62, 0.64 mm, etc. ), until the first decades of the twentieth century the ultimate caliber of the strings was determined almost exclusively by the number of guts used to make a string of a given diameter. As certain documents show (56) , the strings on sale were distinguished not by their diameters in mm but by the number written on the packet which served to specify how many guts were used to make the strings inside the box. String makers had always endeavoured, to the best of their ability, to standardize the quality and type of gut used: by using material from lambs of the same age, race and geographic area and by selecting the guts carefully before combining them. Nonetheless, there was inevitably a margin of uncertainty or variability in the diameter of the finished product. Nor could this be remedied by manual polishing (which lacks the precision of mechanical rectification), for there was a strong risk of making an untrue string, owing to the real difficulties of achieving perfect rotundity in the gut, with the added risk of excessive damage to the surface fibers. In fact, to avoid this risk, in late nineteenth century violin first strings were usually not polished at all (57). The diameter of a string made of three lamb-guts, for example, could thus be represented by the Gaussian curve. And the same, of course, applies to strings of other gauges obtained by combining different numbers of fresh guts. The skill of a good string maker consisted in being able to manufacture a box of strings (which would be marked, for example, as “3”) with a low oscillation around the mean diameter and to reproduce this mean diameter in different batches of strings made at different times. Such abilities were understandably highly appreciated by musicians. The mark of a good maker was therefore the achievement of a narrow Gaussian curve for the string diameters. An idea of the diameter variance of strings made with the same number of guts can perhaps be deduced from the three degrees of tension George Hart recommends for a violin first string: they range from 0.65 to 0.73 mm. Inevitably, with the increase in the number of guts twisted together (to obtain thicker strings), there is a corresponding decrease in diameter variance, explained by a “mediation” effect arising when a larger number of guts are used. With increasing numbers, we also note smaller differences in gauge between adjacent numbers (for example, between a string of ten guts and one of eleven). Let us now examine the historical information from the string makers. -The first record of Italian string making known to us would seem to be De Lalande’s above-mentioned Voyage en Italie, a work that contains very interesting information on the most important string makers of the Abruzzi (58). Among them are included Angelo and Domenico Antonio Angelucci, the owners of an important string factory in Naples in the early eighteenth century; Domenico Antonio died in 1765 (59). From this document we learn that making a violin first string requires three whole lamb guts of eight to nine months of age; the bottom string — i.e. the third, not the fourth which was, as we shall see below, overspun — needs seven guts (60). The use of three guts in the making of a first string is also mentioned in a do-it-yourself recipe dating probably from the beginning of the eighteenth century (61). The same tendency — that of using three, sometimes four, whole guts for a violin E string — remains constant throughout the nineteenth century (62). It even appears in Maugin and Maigne’s manual, which cites information from the French stringmaker of Neapolitan origin Henry Savaresse: “Les chanterelles se composent de 4, 5 ou 6 fils, selon la grosseur du boyau, et chaque fil est formé d’une moitié de boyau divisé dans sa longueur. Les ‘mi’ de violon ont de 5 à 4 fils pleins, mais très fins. Les ‘la’ en ont le meme nombre, mais plus forts. Quant aux ‘re’, ils en ont de 6 à 7 pleins” (The chanterelles are made of four, five or six strands, depending on the thickness of the gut, and each strand consists of a half gut cut lengthwise. The violin E strings have from three to four whole, but very thin, threads. The A strings have the same number, though stronger ones. As for the D strings, they have from six to seven full strands) (63). 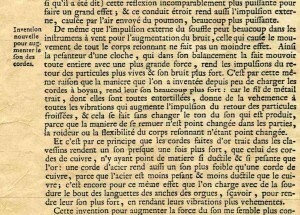 This is confirmed by Philippe Savaresse, who writes: “On a longtemps attribué la supériorité des cordes de Naples aux secrets de fabrique, plus tard on l’a attribuée à la petite espèce de moutons qui permettait de faire les chantarelles à trois fils” (For a long time the superiority of Neapolitan strings was attributed to manufacturing secrets; later it was attributed to a type of sheep that allowed one to make chanterelles with three strands); further on he adds: “La chantarelle ayant trois fils, si les autres cordes sont faites avec les mêmes intestins, la seconde aura 5 ou 6 fils et la troisième 8 et 9“ (With a chanterelle of three strands, if the other strings are made with the same gut, the second will have five or six strands, the third eight and nine) (64). Clearly, when the gut is split in half, twice as many pieces are needed to make a string. One can therefore conclude, with a certain margin of certainty, that a violin chanterelle was universally made by the Italian string makers – but also by the French and Germans – from three (sometimes four, if thinner) whole guts of ca. one-year-old lambs or from double the amount if previously split in half. But how does we translate all of this into string diameters? The answer can be obtained both by experimental means and by examination of the historical documents. As regards the former method, we find that the manufacturing of strings today from three whole lamb guts normally leads to unsmoothed string diameters ranging between 0.66 and 0.75 mm. And what about the historical documentation? The most significant source from eighteenth-century Italy offering useful evidence for determining diameters is undoubtedly the work of Count Giordano Riccati from Treviso. Riccati was not only an accomplished physicist in the field of acoustic and harmonic theory, but also an accomplished violinist. His book Delle corde, which he began writing in 1740, accurately measures the weight and length of the first three gut strings of his violin: “Colle bilancette dell’oro pesai tre porzioni egualmente lunghe piedi 1 ½ veneziani delle tre corde del violino, che si chiamano il tenore, il canto e il cantino. Tralasciai d’indagare il peso della corda più grave; perchè questa non è come 1’altre di sola minugia, ma suole circondarsi con un sottil filo di rame” (Using gold-weighing scales, I weighed three portions, each 1 ½ Venetian feet long, of the three violin strings, those called the tenore, canto and cantino. I omitted the weight of the lowest string, because unlike the others this is not of gut only, but is usually surrounded with a thin copper wire) (66). Assuming the mean specific weight of gut to be 1.3 gr/cm3, the diameters of the E, A and D are: 0.70, 0.90 and 1.10 mm. The same diameter of the E string is also found on an extant violin chanterelle of silk (silk having approximately the same density as gut). This string, which had never been used, dates from the very end of the eighteenth century and is today preserved in the Académie de Sciences in Paris along with some harp strings (67). ed and have diameters ranging from 0.66 to 0.68 mm. This confirms the hypothesis that the manufacturing tradition outlined earlier remained consistent. Paganini’s strings. Among the evidence in the Palazzo Rosso inventories in Genoa, these finds (more details in Recercare XII, 2000, pp.137-47) consist of a violin bridge, two bows (one broken at various points), a box of rosin made by Vuillaume, and a roll of gut strings in a reasonable state of preservation. It on this last item that our attention is focused. For it is the first, if not only, instance of gut string samples that can be dated with some certainty: in this case to the early decades of the nineteenth century. The material that we inspected, in April 2001, was preserved in an envelope that had already been opened by its discoverers. 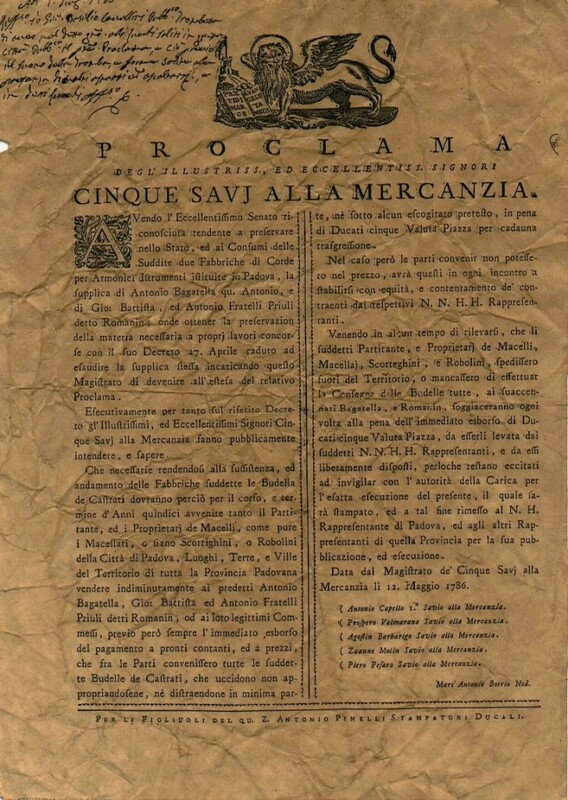 It bears the stationer’s stamp of the “Cartoleria Rubartelli Genova”, has a seal of red sealing wax showing the symbol of the City of Genoa and a manuscript inscription in black ink: “Antiche corde del Violino di Nicolò Paganini”. We measured the string gauges with a micrometer; the strings can be assumed to be two “Ds”, three “As” and two “Es”: it would seem likely that they are segments taken from longer lengths and cut to size for the violin. They are straw-yellow in colour, fragile, slightly wrinkly and intact (i.e. never used). Ruffini, the greatest of the late nineteenth-century Neapolitan makers (and not a violinist working in England, as Segerman has suggested) (70), exported his excellent products to cities all over Europe. Strings made in Naples, and particularly by Ruffini, were in great demand in Victorian London: “The best strings in the market to-day are imported from Signor Andrea Ruffini, of Naples, which are sold by all the leading violin-dealers in London (71)”. As can be noted, Ruffini’s strings — about whose diameters Huggins writes: “these were found to be in about the same relative proportion to each other as the sizes indicated on the gauges sold by several makers (72)” — coincide almost exactly with those calculated by Riccati over a century earlier. This should come as no surprise if we consider that neither the primary resource (the gut of lambs aged eight to nine months) nor manufacturing procedures had undergone significant change since De Lalande’s day, either in Italy or in France. In all likelihood this was equally true for the other Italian cities renowned for their string production, such as Padua and Rome; for all the Italian manufacturers would appear to have descended from the same line of string makers, those of Salle, Musellaro and Bolognano, who later spread over the rest of the country (73). Assuming that the gut used to make the violin E, A and D strings is of exactly the same type and has the same amount of twist, then the number of guts used and the final diameter are, at least in theory, mathematically related (75). Given that the first string of the violin tended to be made of at least three whole lamb-guts (as we saw above) and had a mean gauge of, say, 0.70 mm, then the theoretical diameters of the second and third strings — of respectively five-six and eight-nine guts — are 0.90-1.00 and 1.14-1.21 mm (76). 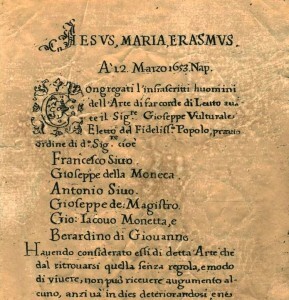 The correspondence with the evidence of Riccati, Savaresse, Ruffini and other French sources is remarkable and seems to confirm our hypothesis that manufacturing procedures were standardized in both Italy and France (though for France, as we saw earlier, this would probably apply as from the beginning of the nineteenth century) (77). Given that the string length was already sufficiently standardized, the variations in violin working tensions in the eighteenth and nineteenth centuries seem to be mainly the result of variations in pitch standards (78); to a lesser extent they can be attributed to the personal preferences of those who, with the aid of a string-gauge, opted for the larger diameters contained in the boxes (each box of first, second and/or third strings would contain several dozen strings soaked in olive oil, each with the same number of strands) (79). To support the hypothesis that during the early decades of the nineteenth century the tension of violin strings radically increased merely as the result of an increase in string diameters, some scholars use the data from Spohr’s string-gauge (80). The marks indicated on the gauge —18, 23, 31 and 25— represent the diameters of the E, A, D and the overspun G (the external diameter, probably). As the system of conversion is not known, They thought fit to refer to a gauge system still used today by certain string makers such as Pirastro: a system that already existed in the nineteenth century and that assigns 20 “grades” to each millimeter. Accordingly, a string marked as 20 P M would have a diameter of 1 mm (20 x 5 = 100 hundredths of a millimeter). In this way the following calibers were calculated: E = 0.90 mm; A = 1.15 mm; D = 1.55 mm and G = 2.22 mm (like equivalent solid gut). In our opinion, this interesting hypothesis is inconsistent with Spohrs writings, for he not only recommends Italian strings over those made in Germany (which he found too stiff), but also suggests choosing a “light” stringing. And that is not all. If we consider the sizes on his string-gauge illustrated in the text and the position of the markings for measuring the strings, we clearly see that on the basis of the proportion between the total length of the slot and the approximate estimate of its width at the opening — ca. 2 mm — the distance of the E marking shows a width of ca. 0.70 mm rather than the 0.90 mm suggested by Segerman. Therefore the correct ratio is more likely to be a factor of 4, and not a factor of 5, which in any case is based on the subdivision of a modern unit of measurement and not the (unknown) unit of Spohr’ s day (81). The calibers derived from Spohr’s gauge should therefore probably be E = 0.72 mm; A = 0.92 mm; D = 1.24 mm; G = 1.00 mm (corresponding, in our opinion, to the external diameter): results that are evidently in line with the preceding data. It will have surely not escaped the observant reader that the string diameters hitherto described do not at all lead to stringings with a system of equal tension but instead to one of the scaled type (for comparison, an arrangement in equal tension, starting for example from a chanterelle E of 0.70 mm, would give the following diameters: E = 0.70 mm, A = 1.05 mm, D = 1.60 mm). Today it is commonly held that a correct stringing for the violin or another instrument must have all the strings at the same tension (in other words, with the same kg), but in fact this is not at all how things stand. Before pursuing the analysis of the documentation we must therefore tackle this fundamental point, for it affects the way we reconstruct the stringings of all the plucked and bowed instruments of the Renaissance and Baroque – not only the violin. Let us begin our discussion of this subject with the concept of ‘tactile sensation of stiffness’. For it needs to be stressed that when a musician applying the pressure of his fingers evaluates the tension of the strings of his instrument, he is actually not evaluating the kg of tension at all, but instead the sensation of tension, which is quite another matter. “Of setting the right sizes of strings upon the lute. […] But to our purpose: these double bases likewise must neither be stretched too hard, nor too weake, but that they may according to your feeling in striking with your thombe and finger equally counterpoyse the trebles” (82). “When you stroke all the stringes with your thumbe you must feel an even stiffnes which proceeds from the size of the stringes” (83). “The very principal observation in the stringing of a lute. Another general observation must be this, which indeed is the chiefest; viz. that what siz’d lute soever, you are to string, you must so suit your strings, as (in the tuning you intend to set it at) the strings may all stand, at a proportionable, and even stiffness, otherwise there will arise two great inconveniences; the one to the performer, the other to the auditor. And here note, that when we say, a lute is not equally strung, it is, when some strings are stiff, and some slack” (84). From the treatises of the time one deduces therefore that the criterion for choosing the strings in a given stringing responded above all to principles of empiricism: the strings were expected to be neither too tense nor too slack but to have a just degree of tension; and what is important, this tension was expected to be evenly distributed among all the strings. It goes without saying that any judgement of the degree of tension is merely subjective. A different matter, on the other hand, is the search for evenness of tension between the strings, which is the true, shared criterion of reference. In conclusion, when the early documents use the words ‘equal tension’ (and we find them until at least the end of the eighteenth century) they consistently mean ‘equal feel’ and not equal kg, as instead is done today. A pertinent example is the following passage from Galeazzi: “la tensione dev’esser per tutte quattro le corde la stessa, perchè se l’una fosse più dell’altra tesa, ciò produrrebbe sotto le dita, e sotto 1’arco una notabile diseguaglianza, che molto pregiudicherebbe all’eguaglianza della voce” (the tension must be the same for all four strings, because if one were more tense than another, that would create under the fingers, and under the bow, a considerable inequality very prejudicial to the equality of tone) (85). Here tension clearly means feel; as is equally plain in Bartoli’s treatise: “Quanto una corda è piu vicina al principio della sua tensione, tanto ivi e piu tesa. […] Consideriamo hora una qualunque corda d’ un liuto: ella ha due principj di tensione ugualissimi nella potenza, e sono i bischieri dall’un capo, e ‘1 ponticello dal1’altro; adunque per lo sopradetto, ella è tanto piu tesa, quanto piu lor s’avvicina: e per conseguente, e men tesa nel mezzo” (The closer a string is to the beginning of its tension, the tenser it is. […] Just consider any lute string. It has two beginnings of tension that are absolutely equal in power: the pegs at one end, the bridge at the other. As a result, it will be tenser the nearer it is to those points and less tense in the middle) (86). To try and give some kind of scientific expression to the concepts of ‘even stiffness’, ‘equally strung’, etc. described in the treatises is in itself a somewhat complex matter, both because there is no conclusive proof that by ‘feel’ they all meant the same thing and also because that ‘feel’ can be also understood in a, so to speak, broader sense. A preliminary distinction (when evalutuating the degree of ‘tension’) can be made, for example, by deciding whether in pressing down on the strings it is directly the fingers or the bow hairs, for in the latter case the thicker strings can oppose more resistance to the rubbing movement, thereby giving the musician the sensation of a certain unevenness. To resolve this specific problem the use of scaled tension was justified on the violin by Plessiard (87). not the bow) that are required to assess the tension of the strings, we can again understand ‘feel’ in at least two ways. The first (that commonly accepted, by the present writer as well) considers the effort required to impart a certain meaure of lateral displacement to a string, which obviously opposes the pressure exerted. If we replace the finger with a weight acting at the same point, we can exactly measure the quantity of lateral displacement for every string examined. The second hypothesis, introduced by Segerman (88), considers that a thinner string, which digs more deeply into the finger tip pressing down on it, would produce a greater sensation of tension than a thicker string, which, having a wider surface, does not ‘dig into’ the finger to the same extent. According to this second interpretation, therefore, ‘equal feel’ involves more tension in kg in the thicker strings than in the thinner. As Segerman himself stresses, we have never yet had practical evidence that the bass strings have more tension than the higher ones. Let us therefore examine the first hypothesis better: in other words, that which considers ‘feel’ to be the sensation of resistance given by a string pressed by the fingers and ‘equal feel’ to mean that this sensation is the same also for tuned strings of different diameters; in other words, that when the same weight acts at the same point, the lateral displacement encountered is the same. The vibrating length obviously has to remain constant. According to the laws of physics such a conception of equal feel corresponds exactly to a stringing of equal tension (89). That is true, however, on condition that the initial diameters of the strings (as measured with the strings not yet mounted) remain unvaried even after they have been tuned, i.e. under tension. In pratice, however, and especially with gut, this never happens: once the strings have been tuned to the required note, their respective calibres have dimished in different ways. This happens because the material possesses a certain longitudinal strain which is related also to the diameter (which in gut is divided into recoverable strain and non recoverable strain: in practice once a new string has been placed under tension, it no longer reattains its initial diameter at rest). This reduction of calibre will therefore also imply a corresponding reduction in working tension. It is observed that the thinner strings lengthen more and hence diminish in calibre by a greater percentage than the thicker ones (it is generally known that the thinner strings require many more twists of the peg than the thick ones). And so it also follows that, after tuning, the respective working tensions (established as identical to start with) will no longer be equal but scaled: in other words, the thinner the string, the lesser the tension. As a result, therefore, the ‘feel’ between the strings is no longer equal (because the tensions are now different) but instead unbalanced in favour of the thicker strings. In other words, on the thicker strings more pressure from the fingers is needed to obtain the same quantity of lateral displacement as on the thinner ones. Hence according to the laws of physics, if the tensions are not equal, nor is the lateral displacement; nor, therefore, is the feel even. As an example, we tested two gut strings of medium twist calculated to have the same tension (8,3 kg at a pitch of 440 Hz) when brought to the required pitch (the violin ‘E’ and ‘D’ in this case). The vibrating length is obviously the same for both (33 cm). We obtained calibres of 0.65 mm for the ‘E’ and 1.45 mm for the ‘D’ when measured at rest, i.e. not under tension. Once they had been tuned and stabilized, we proceeded to measure their diameters: the calibre of the ‘E’ had reduced to 0.62 mm, whereas there was no noticeable drop in the ‘D’, even when measured by a micrometer. Hence while the thinner string had dimished in diameter by 5%, the thicker string be considered as unvaried for practical purposes. These values are of an experimental type: which means that strings made in different ways may provide different percentages of reduction. The constant factor, however, is that – manufacturing techniques being equal – it is always the thinner string that contracts more. In our case the tensions of the strings stretched on the instrument reduced to 7.6 kg on the ‘E’ and 8.3 kg on the ‘D’ compared to a calculation value of 8.3 kg in both cases. In order to have ‘E’ and ‘G’ strings that retain the kg decided on initially when tuned to pitch, one must therefore increase the initial gauge of just the ‘E’ by 5%, i.e. 0.68 mm. When making the traditional calculation to obtain the tensions of this second pair of strings ‘at rest’ one detects a trend of the scaled type: namely 9.2 kg for the ‘E’ string and 8.3 kg for the ‘D’. To sum up: the experiment shows that calibers of 0.65 and 1.45 mm lead only to a theoreticalstate of equal tension; conversely, if one uses diameters of 0.68 and 1.45 mm, once the strings have been tuned (i.e. in traction) they will assume a new, and more reduced, diameter situation, such as would exactly produce equal tension, i.e. equal feel. This situation was in fact verified – with the assistance of a micrometer – in a second experiment carried out on this second pair of tuned strings. If one wants a stringing of equal feel, it is therefore necessary to use criteria of scaling when selecting the diameters of strings ‘at rest’ (i.e. not in tension). As mentioned earlier, one advantage of scaled tension is that the increasing attrition encountered when moving the bow from thin to thick strings (because of the larger contact surface) is much less noticeable. If we respect the condition that there should be equal tension between the various strings at pitch, one concludes that scaled tension and equal tension (measured at pitch) express the same thing: equal feel. Although the test reported in the first version of this article (in Recercare IX of 1997) produced substatially correct results, the interpretation of the data turned out to be wrong. The same consideration applies to another example cited there: that of an elastic band and steel string whose diameters were calculated to have the same tension values to start with. When tuned to the same pitch, only the elastic band will reduce considerably in section to assume a new, lower state of tension, in contrast with the unextendable steel string. At this point, therefore, the feel will be different. Di Colco writes: “Siano da proporzionarsi ad un violino le corde […] distese, e distirate da pesi uguali […]. Se toccandole, ò suonandole con l’arco formeranno un violino benissimo accordato, saranno bene proporzionate, altrimenti converrà mutarle tante volte, sin tanto che l’accordatura riesca di quinta due, per due, che appunto tale è l’accordatura del violino” (The strings are to be proportioned to the violin […] extended, and stretched by equal weights […].If by touching them or playing them with a bow they form an excellently tuned violin, they can be considered well proportioned, otherwise you will need to change them as many times as necessary to obtain fifths between pairs of strings, which is precisely the tuning of the violin). Barbieri believes that in all likelihood these considerations are purely speculative. Mozart, on the other hand, drawing on the same concepts, suggests attaching equal weights to each pair of strings: if the diameters are well chosen, the open strings will give fifths; otherwise the diameters will need changing until that result is obtained. -The cases of Mozart and Di Colco can lead to a certain interpretative confusion. Indeed it has been attempted to conclude hastily that they are stringings in equal tension: as if they had been worked out by ‘sitting at a desk’, so to speak, i.e. based on formulas. Appearances, however, are misleading. The test recommended by Mozart takes place in conditions of equal weights (i.e. equal tension) that already work on the strings. This situation therefore does not at all replicate that of apparent ‘equal tension’ obtained by means of calculation by establishing the same kg in the formula for the strings with the purpose of obtaining all the diameters of the stringing (a tension that, as we saw, will be diversified because of the differences in the thinning of each string after tuning). In his case the pairs of strings are chosen in a state of actual traction, not of calculations done on paper. Seeing that this is a situation of true dynamic equal tension (because the weight always remains the same), we therefore find that the strings also display equal feeling. In other words, the method suggested by Leopold Mozart achieves what we indicated above, though by a different route. It is evident that the strings chosen by Mozart as suitable for the purposes of tuning in fifths would present initial diameters ‘in the packet’ that theoretically display a profile of scaled tension, exactly as in the other cases described. -We conclude by observing that the degree of scaling mentioned hitherto does not correspond to that found in most of the historical documentation. The tension slope is steeper. In other word, one cannot detect a situation of equal feel. Unfortunately, at present there are no documents that can offer illuminating evidence for why this practical choice was made by the violinists of the time. Huggins (91) advances two hypotheses: the first takes into consideration the pressure exerted by each string on the table of the instrument. He stresses that in a state of equal tension (but also of equal feeling, we add) the pressures in kg exerted by the first three strings on the underlying table are not at all equal; and this is because the angle of incidence of the string on the bridge is increasingly acute towards the thicker strings. Hence a greater thrust on the table. To obtain equal pressures on the table from every single string what is needed therefore is an ‘additional’ scaling to the condition hitherto considered. The second hypothesis considers the fact that as a rule the thicker strings are progressively more distant from the fingerboard: the result, therefore, is that in a condition of equal tension/equal feeling the fingers of the left hand must make a further effort when pressing down on the fingerboard. Hence the reduction of tension, with the aim of recovering evenness of feeling in the fingers of the left hand. (‘First it is necessary to say that in spite of the fact that the bow touches a greater surface in the bigger strings, its action is nonetheless constant, provided that equal force is used in pressing the bow on the strings. This force is distributed equally to all the parts touched, and hence two equal particles on different strings undergo pressures inversely proportional to the total surfaces encountered by the bow.’ ). Let us now resume our investigation of the documents. The examination of the historical sources relating to violin stringings has prompted some scholars to assume that two systems of stringing coexisted in the eighteenth and nineteenth centuries: a scaled system and one based on equal tension (from theoretical calculation). In the light of what has just been discussed, the hypothesis of theoretical equal tension is no longer sustainable in relation to the practice of real stringing. – Fétis wrote that Tartini in 1734 found that the sum of the tensions of the four strings of his violin was 63 pounds (96). Quite apart from the matter of how Tartini arrived at this figure (and if it was then correctly converted into other units of measurement), it needs to be stressed that it does not lead to a confirmation of equal tension, but most likely to a scaled stringing, as is clearly indicated by the calculations given below. As we can observe, however, the diameter of the chanterelle conspicuously exceeds the range of calibers obtainable with 3 lamb guts (which, as we know, is the basic historical fact). be almost enough to reach the figure indicated by Tartini for all four strings). In order to achieve the 31 Kg indicated by Tartini one would necessarily need to have an overspun G generating about 6.5 Kg of tension. That would correspond to a theoretical all-gut string of at least 1.90 mm. Here our assumed factor of conversion is 3.3. A system of progressively increasing tension is evident, as is the fact that the fourth string must have been overspun. We also note a similarity between the string-gauge and Spohr’s diameters; particularly in the degree of scaling and in the (external, we think) dimensions of the fourth string or “cordone“. As the “back” measurement is expressed in hundredths, the unknown unit of measurement should then be 33-35 cm. First of all, we note that the working tension of the top string is strangely lower than that of the A. This might be just a printing error: perhaps 8.5 kg was meant, instead of 7.5 kg; if so, the diameter of the top string would be 0.68 mm, which is perfectly in line with the Italian and French traditions. But the most striking evidence of the unreliability of such working tensions is the breaking load of the gut strings: the first string (0.63 mm) would break at between 12 and 13 kg; the second (0.96 mm) at 15 kg, and the third (1.40 mm) at between 40 and 45 kg. Our findings show that the breaking load of current gut strings is between 31 and 38 kg/mm2 (mean value 34 kg/mm2) — values that we also found on the gut string samples dating to the early twentieth century. It is worth stressing that if this were not the case, no violin first string of the time could be tuned up to E with the typical vibrating length of 32-33 cm; it would immediately break once the breaking index for gut was exceeded (95). Now, according to the tensions indicated in the text, Savaresse’s gut would have a breaking load of 38-41 kg/mm2 for the E (33-36 kg/mm2, with a diameter of 0.68 mm) — which is acceptable — but of only 21 kg/mm2 for the second and as little as 17-19 kg/mm2 for the third. As the breaking load of gut has been shown experimentally to be an element that is subject to scant variability — especially when the materials have the same provenance and are manufactured in the same way (as is always the case) — one might well ask what string diameters would break at the tensions indicated by Maugin and at the mean breaking load of 34 kg/mm2. The answer is 0.75 mm for the A and 0.98-1.04 mm for the D: calibers utterly different from those derived from the working tensions indicated by Maugin. But that’s not all. We also read that the second and third strings weigh respectively twice and three times as much as the first. Assuming that the diameter of the first string is correct and (obviously) that the density of the material is constant, we obtain diameters of 0.89 and 1.09 mm for the second and third strings respectively. Quite plainly these measurements correspond to a system of progressively increasing tension, and are perfectly in line with both the number of guts indicated in the same text and the information given by De Lalande. Hence the system of equal tension advocated by Maugin and Maigne is heavily contradicted in the same text by Savaresse, who bases his conclusions on the manufacturing data of commercial strings. Several english, german, francaise sources in the late nineteenth/early twentieth centuries quote the string making information reported by Maugin and Maigne. This includes, also, Angeloni’s manual, which presents these erroneous data. (65). There are some other nineteenth-century authors who apparently supported a system of equal tension. Huggins, for example, after giving the theoretical gauges on the basis of the proportions between diameters and frequencies (implying a system of equal tension), goes on to write: “A violin strung with strings of the theoretical size was very unsatisfactory in tone“; immediately afterwards he mentions the diameters sold in Ruffini’s sealed boxes, pointing out that these strings had a scaled tension and — an important point — that only by this system could one obtain perfect fifths (98). Like Huggins, many other English documents of the same period recommend stringings that follow a system of progressively increasing tension, with diameters again similar to those of Ruffini/Hart and, more generally, to the French and Italian traditions (99). We find exactly the same indications, above all in the English violin methods, right up to the onset of the Second World War.